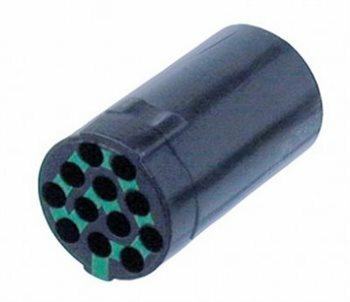 12 pole Miniature Connector. Modular very compact design. Up to 12 snap-in contacts per connector. Push-pull self-locking system. Precisely machined and robust all metal design. Gold plated contacts, crimp or solder. Excellent protection for a wide range of cable diameter. Receptacles for vertical and horizontal PCB mounting.